Todays episode in 12 days of Christmas decorations will help you unleash the kid inside you. Or give your kids permission to go unleash their wild side inside. Your choice. Welcome to day 5 of my series! Today’s project was the first one finished. Way back in the beginning of November I enlisted some help with this one, so it has been ‘done’ for a while now. And let me tell you I have been looking at it daily and I am still loving it to pieces. I’d call that a success in my book. The project is fairly simple it just takes some time to execute. 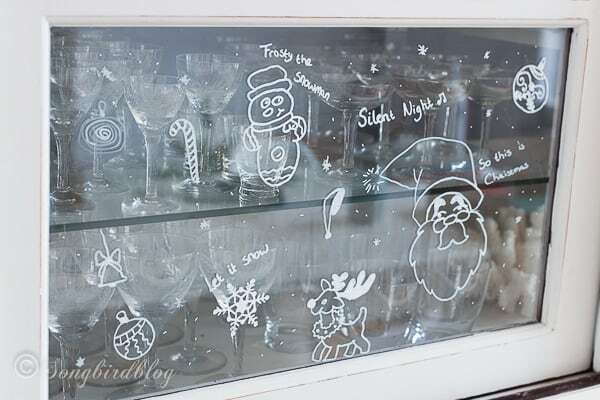 Did you know those chalk board pens work perfectly on glass too? And that you can erase them completely without a trace with just some water? I did a test run way back in the summer on a mirror. Left it up for months and it came right off without any effort. So I know this is safe to plaster all over my hutch windows. Every pane of my hutch has been decorated with every possible Christmas text or figure possible. I knew I might be able to pull this off myself. But I figured it would be much more fun if I could ‘discover’ all the decorations over time. So I enlisted some help. My fully grown niece and nephew, and his girlfriend, were totally up to unleashing the little kid inside and show of their long lost Kindergarten skills. So I provided sweets to go along with the coffee and tea, put on some stimulating music, put a marker in their hands and let them go to town on my hutch. It was so fun to see them go at it, all serious. Complaining about their lack of drawing skills. They were hesitant at first. Coming up with small drawings first. Ipad to the rescue: search for Christmas drawings or Christmas pop-art and you’ll find endless ideas. Of course Christmas stories and lyrics also are a good inspiration. As you can see even the Christmas mouse has made an appearance. I hope these images convey how cute this looks in real life. It really does. Every time I sit down at the table opposite of my hutch I keep looking at it, discovering new bits every time. My friendly artists even got really artistic when they figured out this trick. See those wise men on their way to the Christmas couple? When it gets closer to Christmas, so do they…. Perfectly spaced out: if I open the window panes the wise men get closer to their destination. Cool! When the scribbling was done, I decorated the inside of the hutch. Mostly in white and silver but with some red accents. Nothing too fancy. I basically used all the stuff that lives inside the hutch anyway and just scattered Christmas ornaments around, added some faux flowers and filled up containers. Christmas window decorations on my hutch. Of course this would also look really cute on a door or real window so it is visible outside. As a variation one could do only text, or only stars, or hearts, or snowflakes, or a bit Christmas tree…. The options are endless and I bet it all would look really good. I am loving my hutch, and knowing that those special helpers created this for me, makes it extra sweet. 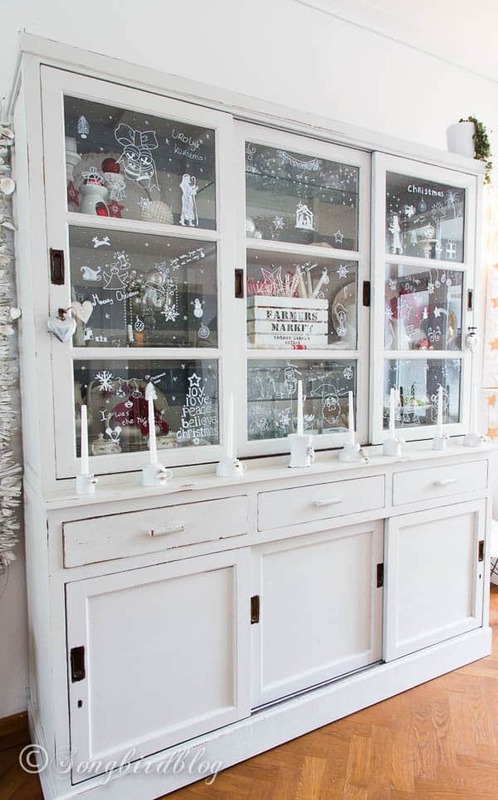 I hope you enjoyed my Christmas hutch too. (in case you are wondering those Christmas teacup candle holders are from day 2 of this series). Don’t forget to visit my friends. There projects are blowing me away too. Positively charming! The hutch sort of has the illusion that it’s snowing because of the drawings… I want some of those pens! Such a neat and easy idea! Shazam … wish I had a hutch with windows. I’d color up a storm. Great job! Love it! And iPad to the rescue! Thank you for that tip! Hope you’re able to check it out!